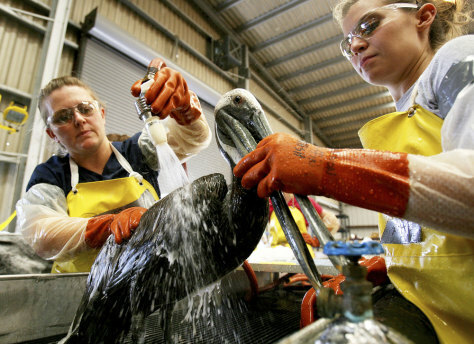 Wildlife rehablitator Shannon Grisson, left, and volunteer Heather Bryant clean oil off a brown pelican at a rescue center. Most work involving contact with oil will is being performed by Qualified Community Responders (QCR). General volunteers won’t be cleaning birds or washing oil-covered beach items, but they are definitely needed.